My friend Friederike (of Clean Team fame) claims that bringing a decrepit ruin back to life is an act of poetry. She should know; she’s done it twice. In Milan, there’s evidence that poetic renovation is not a recent phenomenon. Tucked away in the high-end fashion district, on Via San Spirito, is a museum that was once the home of two very poetic brothers, Fausto and Giuseppe Bagatti-Valsecchi. I'm sure the dining room was homey for its time. Authentic to the last detail. 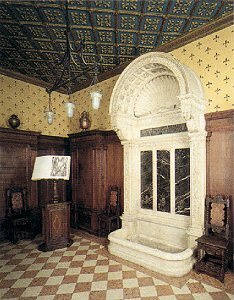 Although they lived in 19th century Milan, their vision was to create a palazzo that perfectly reflected the Renaissance period in Italy, particularly Lombardy artifacts from the late 1500s and early 1600s. Their house became, in effect, a living museum of the period they most admired. 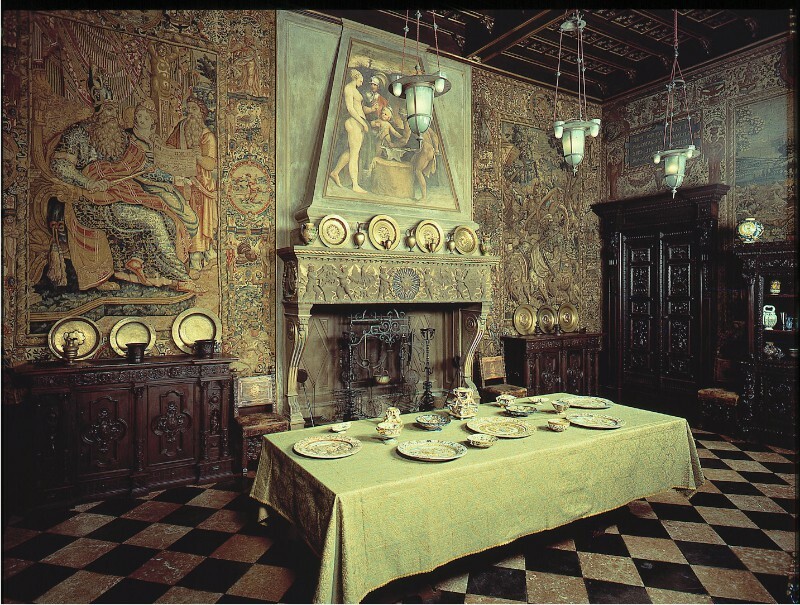 Every domestic object, work of art, piece of furniture, wall of paneling, fireplace mantel or stone frieze in their extensive collection was incorporated into their daily life. The opulent bathroom. Lacking a magnificent Renaissance stone shower stall, Godzilla will have to rely on its view. If a piece they found was damaged or didn’t quite fit the space they intended for it, they had it repaired or made complete by craftsmen expert in the methods of the object’s original period. Thus, for example, the wooden coffered ceiling taken from a Renaissance period palazzo and modified, with no trace of the change, to fit the ceiling of the Camera Rossa. Or the period stone bath retrofitted discreetly for running water, a plumbing modernization of their own era. 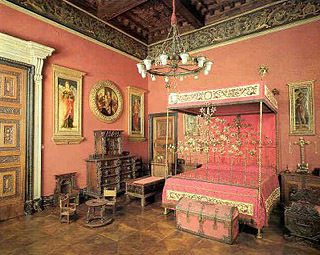 Today, thanks to a foundation set up by their descendants, you can visit the Bagatti Valsecchi home and see it just as it was when they lived there. It’s my absolute favorite museum in Milan. The incredible attention to detail resulting from their passion for the architecture and artifacts of the period, and the grace with which it’s all been put together, is an act of love. And poetry. As a pied-a-terre in Milan this would be fabulous but for poetry your rustic option is hard to beat… I love the ‘living’ museums in Italy like this one. There are a few in Milan I need to visit next time around. This one goes to the top of the list!!! It’s pretty wonderful, you get a great sense of how it felt to live there. Somehow I don’t think our new house is going to look much like this. Nor ours! My own architectural dreams are considerably more rustico.